NOTE: This was meant to be posted yesterday, but I’ve been really sick and exhausted, so I had to postpone it. Also, this was meant to be about another one of Morrison’s DC works–which I’m still planning to review–but I didn’t get it done in time. So instead, this. One of the things I talked about on Wednesday was about how Morrison’s writing is full of incredibly big ideas, some of which pay off, others don’t. Morrison’s 41-issue tenure on JLA, the Justice League comic that ran from 1997-2006 (with Morrison kicking the book off), is full of ideas that do. Even better, they manage to feel completely true to the spirit of all these iconic characters while incorporating their history and their (then-current) status quo. I haven’t finished the full run yet–at present, I’m halfway through the famous “Rock of Ages” story–but I like a lot of what I’ve read so far and Morrison’s go-for-broke plotting, along with the dynamic artwork of Howard Porter and Oscar Jimenez, are the reason why. 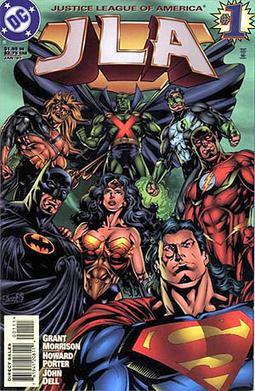 Basically, the setup behind this version of the Justice League–something stated explicitly in the first story arc–is that the League–which here has Superman, Batman, Wonder Woman, Martian Manhunter, Green Lantern (Kyle Rayner), The Flash (Wally West), and Aquaman, with Green Arrow (Connor Hawke) and Aztek joining later on–only meets up in response to bombastic, large-scale threats. Accordingly, every issue is full of gigantic, crazy stuff. For example, the first arc has the League facing off against the Hyperclan, a group of proactive superheroes from space who win over the public with their grand gestures but (of course) turn out to have sinister motives. A two-part story, which introduces the one-time DC Universe mainstay of Zauriel, involves Superman, who at the time had electric powers (it’s complicated), wrestling an evil angel named Asmodel who looked like a giant bull. I repeat: Electric Superman wrestled a bull angel. How do you not want to check that out? Basically, it’s everything I love about old-school comics–the crazy ideas, the weird stuff just tossed at the reader without any rationalizing other than “because”–combined with that punk rock energy Morrison always has, a reverence for and understanding of these characters and a lot more literary pizazz. Of course, a comic book writer is only as good as his artist, and Porter (with Jiminez subbing in at some points), delivers the goods in droves. His characters and backgrounds are big. It’s been said that the DC heroes are gods, and Porter underlies that assumption with art that is energetic, bombastic and pleasing. He’s great fun. If you liked the two Justice League cartoons–my friend at Critical Hit! wrote a great post about them which reminds me I really should get back into those at some point–and you want to know where the go-for-broke stuff came from, this entire run has been collected in trade and is really easy to find. Check it out. 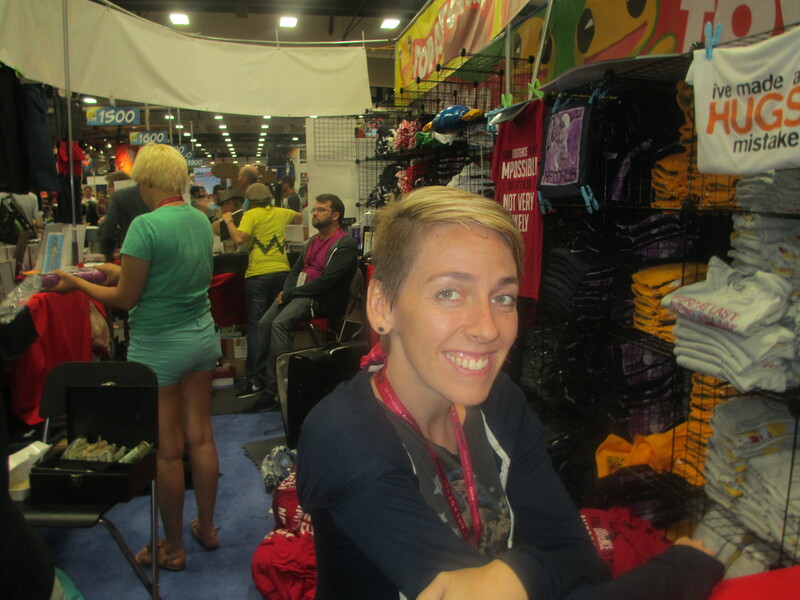 So there was no blog post last Friday because I was at Comic-Con and well…it was Comic-Con, man! It was exhilarating, awesome, life-changing and exhausting all at once. I had a LOT of fun, and I’ll be posting photos here soon, as soon as I get them onto Facebook and run some on Another Castle first. I did for the first day, and you can find them right here. But I forgot to put up before I left something incredibly cool. As I said on here, I was invited to Comic-Con to discuss the work of Carl Barks, the creator of Scrooge McDuck. Well, two weeks ago, I got in touch with Mike Phillips, the editor-in-chief of the Sequart Organization, a fine company devoted to expressing the idea that comics are art. Which is, of course, true. As part of that idea, Sequart recently ran a “Comics Artists Week,” a week of articles devoted to praising artists specifically, as too many comics critics praise writing first and foremost while leaving art at the margins (something I wholly agree with). What I did is take my 20-page paper and simplify the language for a general audience, as well as limit my points to only speaking about art. It’s not plagirizing if it’s from yourself! Sorry this had to be combined but that’s what happens when you get sick on the weekend of a convention. I feel like garbage and unfortunately, I was too selfishly tired to write. My apologies. After that got over at 1, we looked around the dealer’s room which was mostly taken up by this enormous seller of back issues and discounted trades and graphic novels. From there, I bought vol. 7 of Ultimate Spider-Man, the Vertigo book Pride of Baghdad, the complete Omega the Unknown: Classic; from another dealer, I bought the first volume of Mouse Guard. Then I attended a wonderful panel on self-publishing that had authors Tim Kenyon and Mick McArt, who were quite lovely as they spoke on the dirty details of aligning with a vanity press, starting your own press and the ins and outs of publishing generally. Inspiring stuff. Then, after all that, went back to my apartment, had dinner, then attended a screening of Raising Arizona that my college’s Film Arts Committee put on, where a fun time was had by all. By the time I got back, however, I was too bushwhacked to do anything other than watch half an episode of Fringe, then go to bed. Also today, I had the pleasure of meeting legendary Dragonlance co-creator Tracy Hickman (who signed a copy of his new Batman novel for me and talked with me about writing!) as well as talked to the editors and founders of a website that I’ll have more to say about soon. Quite a weekend, eh? If that’s what the first year of GrandCon yields, I expect to be back again and again in the years to come. Also, judging from this post, the Little Red Reviewer was there and I missed my chance to try and arrange a meetup! D’oh!! !